This is the first in a series of blog posts that outline strategies and guidance in Android with regard to power. Your users care a lot about battery -- if it runs out too quickly, it means they can't use your apps. Being a good steward of battery power is an important part of your relationship with the user, and we're continuing to add features to the platform that can help you accomplish this. As part of our announced Play policy about improving app security and performance, an app's target API level must be no more than one year older than the current Android release. Keeping the target API level current will ensure that apps can take advantage of security and performance enhancements offered in the latest platform releases. When you update your app's target API level, it's important that you evaluate your background and foreground needs, which could have a significant impact on power & performance. 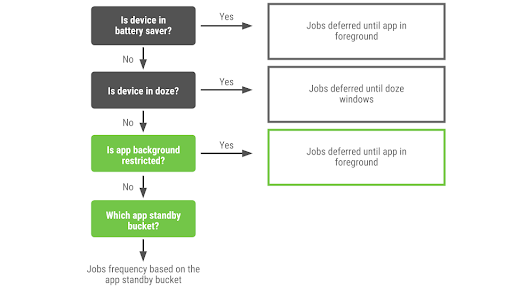 Doze and App Standby in Android 6.0 Marshmallow, which disables network access and suspends syncs and background work - when device or apps are unused for a prolonged period. Doze improvements in Android 7.0 Nougat, which applies a subset of Doze restrictions when the screen is off and not stationary. Background limits in Android 8.0 Oreo, which prevent background services and throttle location updates. This means that the OS needs to be smarter and adapt to user preferences while improving the battery life of the device. To address these needs, we have introduced App Standby Buckets, Background Restrictions, and improved Battery Saver. Please test your app with these features enabled on a device running Android 9 Pie. Battery Saver and Doze operate on a device-wide level, while Adaptive Battery (app standby buckets powered by a Deepmind ML model) and background restrictions operate on a per-app basis. The diagram below helps understand when a scheduled work will run. Similarly, other OS primitives like alarms, network, and FCM messages also have constraints that are described in the developer documentation on power-management restrictions. You can learn more about each of these features via Google I/O presentation, DevByte and additional power optimization developer documentation. We will be publishing a series of design pattern guidances in the upcoming weeks. Stay tuned. Acknowledgements: This series of blog posts is in joint collaboration with Android Framework and DevRel teams.